If they dream of playing in a World Cup they know it can come true because their national team is going. On Friday, Iceland, the smallest nation ever to qualify, was drawn with Argentina, Croatia and Nigeria in Group D.
The latest achievement has left many wondering if the island nation of nearly 340,000 people is benefiting from its investment in the sport, or is it only temporary success? Speaking with The Associated Press at the national football stadium, Laugardalsvollur, former Iceland manager Gudjon Thordarson said the investment was paying off. "Place Iceland's seven indoor halls in Coventry," he said, mentioning an English city with a roughly matching population, "and just wait and see what happens over, say, 15 years." What has already happened, according to Thordarson, is that when Icelanders were able to play soccer year-round, the rest of the sport became more professional. Coaching became a paid part-time job with required qualifications, instead of a volunteer role given to any involved parent. Iceland has 460 coaches with a UEFA B license for training children up to the age of 16, or one per 740 people. Hakon Sverrisson, who left his job as a math teacher to become head coach at the Breidablik club, said he wanted the best coaches to stay with the youngest players because "that's when they learn the most." Every child pays the club's tuition with a 300 euro ($355) voucher provided by the local municipality to support after-school activities. Public funding toward sport clubs and their facilities mean children need to be provided with equal opportunities. "This means it's hard for us to select the 15 or 20 best players and train them extra hard," Sverrisson said. Iceland's place at the World Cup in Russia comes after a stunning run at the 2016 European Championship, where the team made it to the quarterfinals, knocking out England before losing to France 5-2. 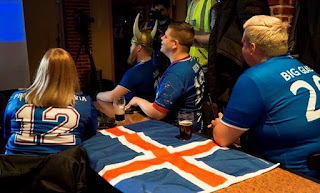 Vidar Halldorsson, a sociology professor at the University of Iceland, argued in a recent book that in an era of big money the Icelandic team preserves an amateur spirit of friendship and sacrifice "while the elite teams have been weakened by greed and individualism." The Icelandic players have relatively modest careers as professional footballers — team captain Aron Gunnarsson, for example, is with second-tier Cardiff in the English League Championship. "Together the players are ambitious and supportive," Halldorsson said, "and always willing to put the team first." The success is not "sport specific," he said, pointing to top-class performances by the Icelandic handball and basketball teams. "Icelanders have not forgotten the 'play' in sports," Halldorsson said, "and with that they champion the values the larger teams have lost in recent years." The matches at the Korinn indoor hall are watched by proud parents, catching up with friends and relatives. Faces are familiar in a country this small, and even Iceland President Gudni Thorlacius Johannesson was there to watch his 8-year-old son. "The kids here, they learn their game and are encouraged to pass the ball to the next player instead of just kicking it as far as you can — tiny things like that give them an understanding of the game," Johannesson told the AP. A father of five and long-time volunteer in youth clubs, the president said the most important thing was that everybody is involved. "We just make sure that everybody has fun, everybody improves himself and everybody has a good time," Johannesson said. "That is what matters to me, not that we are creating professional football players 10 years on or something like that."